Having diabetes makes your feet more susceptible to complications. Education about these risks may prevent injury and avoidable damage to the feet while maintaining a healthy lifestyle. Daily foot examination and care can help you decrease your risk of developing serious conditions like ulcers, infection, circulatory or nerve issues, and injury. Inspecting your feet to look for any abnormalities, maintaining proper hygiene, keeping your feet warm in cold weather, encourage blood flow in the feet, and maintaining an overall healthy lifestyle can discourage other conditions from developing. Contact us today to schedule your evaluation and treatment. Many changes in the alignment and deformities of the foot begin early in life. Imbalances or overuse of lower extremity muscles, limb length differences, improper shoe gear, injury can all develop into adult foot conditions. Some of these changes and maladies can be prevented if caught at an earlier age. A thorough podiatric exam can provide useful information and treatment options for pediatric foot concerns. The area of a bone where growth occurs can be subject to injury and slow or stop growth. Injury to a knee or hip can lead to uneven lower extremity length and uneven pressure on one foot versus the other. An injury to a bone in the foot can lead to persistent pain for children during sports or even normal walking. Assessment of the area is useful in proper diagnosis and treatment options. 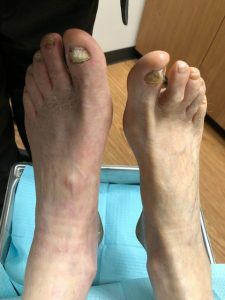 The skin of the feet can present with many changes in color, texture, fullness, temperature and assessment can provide options of treatment for the given diagnosis. Toe nail appearance can arise from injury, systemic changes, fungi and treatment may or may not be an option with medicinal or holistic treatments. Diagnosis of the conditions can occur with physical examination or lab analysis. Contact us today to schedule your evaluation and treatment.